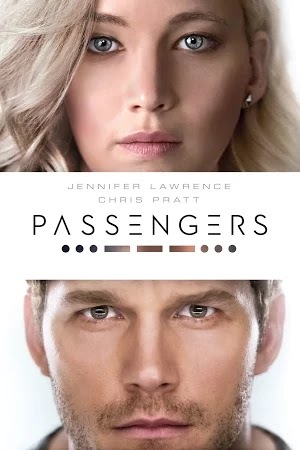 Passengers is one of those movies that bothers me more and more the longer I think about it. And it probably should. It’s a film that doesn’t seem to realize what a creepy story it’s telling. Or maybe it does, but hopes its central characters are likable enough we won't care. In fact, without trying terribly hard, this film could have been recut as a horror thriller (be on the lookout for trailer re-edits on YouTube). It begins with Jim Preston (Chris Pratt) having been woken up due to a system malfunction caused by a few too many meteoroid impacts. Then it lets him wallow in loneliness for a year before finding a cryopod containing an attractive female passenger. After watching all of her pre-recorded video footage and learning as much as he can about her, he finally falls to the temptation to wake her in order to have someone to share the journey with. Perhaps it was my failing while watching the film that I didn’t realize how creepy all of that was until I started writing this description. Yet things only get worse from there. The Avalon, an ark-like starship carrying 5,000 colonists, is on a 120-year journey to Homestead II. The only problem is the malfunction woke Jim 90 years too early. So in effect, his waking of Aurora (Jennifer Lawrence), the aforementioned attractive female passenger, is a death sentence for her. One he knowingly accepted on her behalf. Don’t get me wrong, it isn’t as though the film underplays Jim’s hesitation or even Aurora’s anger once she finds out. Yes, of course, she must find out (even the trailers indicate that he shares his devastating secret with her). But the fact that he’s the one to have done the morally reprehensible deed does lessen the central romance and lead to more troubling moral quandaries than the film cares to deal with. That’s because when it comes down to it, Passengers is a much lighter, fluffier affair than the trailers would lead you to believe. In fact, they most certainly indicate there is a tense sci-fi thriller somewhere along the line, and there isn’t. It follows fairly standard rom-com structure by giving them a meet cute of sorts, allowing them to get to know each other, and then proceeding to the montage of fun times and an eventual romantic date that ends with them in bed together. It even pulls them apart by having the truth come out, only to bring them back together once the film kicks into disaster movie mode in the final act. Yet their forced partnership does little to make up for the troubling decision made earlier in the film. It’s also the kind of movie where you wonder how much was left on the cutting room floor and what kind of movie it could have been otherwise. I’m hesitant to say they’d have bothered casting Andy Garcia in the role of the ship’s captain if they’d known all of his lines would be cut and his screentime would last mere seconds. Then, of course, there is the deceptive marketing for the film and the presence of lines of dialogue in the trailers that don’t make it into the final film. I also can’t help wondering if there’s a version of the film that didn’t use Laurence Fishburne’s character, Gus Mancuso, as a deus ex machina. He appears only after Aurora angrily shuts Jim out, after hearing of his act, in order to force them to interact again. Mancuso’s pod is only the second to fail in 2 years, and he comes along just in time to explain how to fix the ship and give them his crew badge so they can access otherwise restricted areas before the film discards him in order to preserve the romance of two people living their lives alone. That is all to say the films becomes more contrived the longer it goes. To be fair both Jennifer Lawrence and Chris Pratt make for charming leads, though I’m still waiting for Pratt to prove his dramatic abilities. There are some minor flashes of what could be while the film develops Jim’s intense loneliness, but make no mistake this isn’t a film driven by its performances. Instead it comes off as a loose adaptation of Al Feldstein’s comic 50 Girls 50 in which a man awakens from cryosleep and awakens women he had his eye on in order to practice romancing them. The creepy implications of that may have been too much for studios to accept. Passengers had been in development hell for years and was once set to star Keanu Reeves and Emily Blunt - perhaps a cast more appropriate for a tense, creepy thriller. It would seem once Sony got their hands on it, they opted for a softer sci-fi romance featuring a pair of younger box office draws. The real question is whether or not Passengers can win you over and make you forgive Jim’s horrible deed. It tries by making him a sympathetic character who, like an alcoholic, just can’t keep himself from temptation. It aims for pity early on and gets it, even if that doesn’t justify his actions. But when it comes down to it, I’m not sure it earns its forgiveness.